Oh, wait, maybe it had something to do with all that butter, sugar, and egg yolks. BUT I finally made a batch, and while I was at it, I made healthier. I am SO glad I did! My parents love lemon-flavored desserts so I knew they’d love this Lemon Curd. Years and years ago, they were fast food-eaters, soda-drinkers, and “everything unhealthy consumers.” They’ve adopted a healthier lifestyle since then, but are still suffering some of the effects from their old bad habits. They’re trying their best to improve their cholesterol levels and LDL:HDL ratio, and they try to avoid excess added sugar as much as possible. Of course, I didn’t want to make them a typical lemon curd filled with 1 heaping cup of sugar, 8 egg yolks, and 1½ sticks of butter. Um, no thank you. 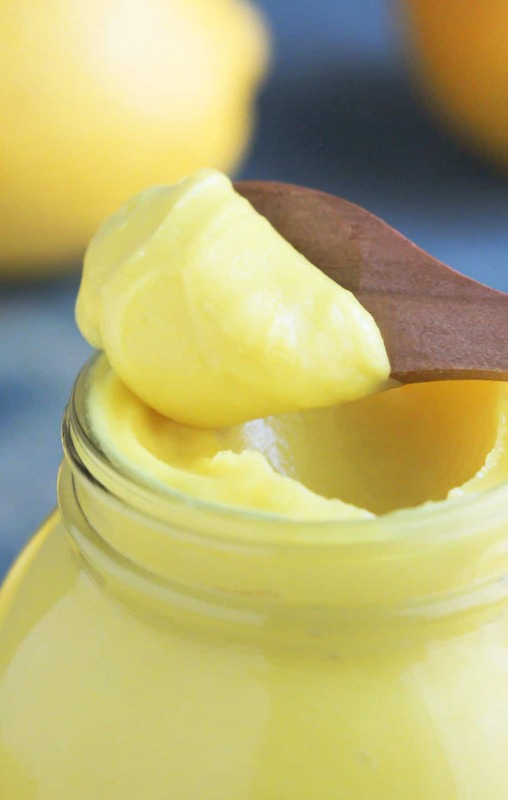 I am neutral to lemony desserts, it’s not really my favorite thing in the world (that’s what chocolate is for), but I’ll definitely eat this Vegan Lemon Curd. It’s just too good to pass up! After taste testing it along with some yogurt, I became a woman obsessed. After my parents taste tested it, they became just as obsessed as I was. Let’s just say we finished the entire batch in a short two days. I think I’ll have to make a batch just for myself and not share. Shhh. Just look at the creaminess. Make it for yourself and you’ll be so glad you did. This easy homemade Lemon Curd is UBER creamy, sweet, tart, and delicious. So delicious you'd never know it's sugar free, low carb, paleo, keto-friendly, gluten free, dairy free, AND vegan too! In a small bowl, whisk together the erythritol, corn starch, turmeric, and salt. Whisk the dry ingredients into the wet ingredients until completely smooth. Whisk occasionally for ~5 minutes. When the mixture begins to warm up, whisk a bit more often. When you hear the water bubble in the bottom portion of the double boiler, whisk the mixture constantly until thickened. Place a fine mesh sieve over a heat-proof bowl and strain the lemon curd. Whisk in the butter flavor. Let the curd cool on the counter for ~1 hour. Cover and refrigerate overnight. The next day, give the curd a whisk to make sure it's even, then spoon into serving jars. Serve and enjoy! 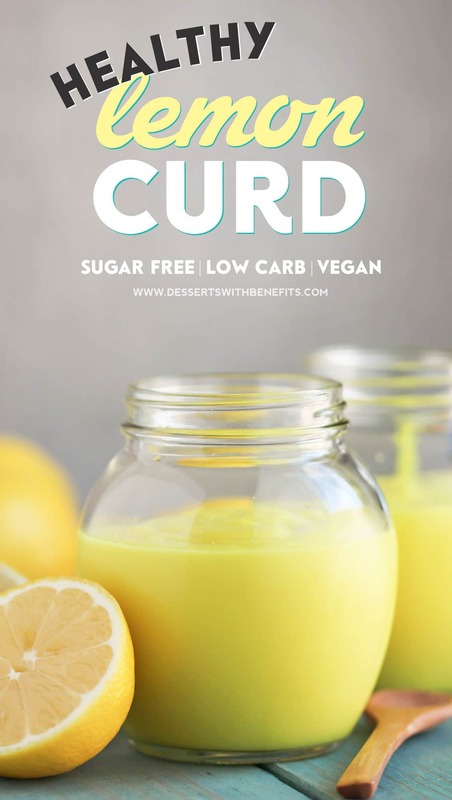 If you compared this Vegan Lemon Curd to typical storebought lemon curd for the same serving size of 2 tablespoons, my healthified version will save you 50 calories and a whopping 18g of sugar! Not to mention, the cholesterol, sugar rush, and jitters. I’m gonna go grab a spoonful of this magical substance, BRB. This Healthy Vegan Lemon Curd tastes DIVINE. It’s tangy, refreshing, and will awaken your senses. Zip some excitement into your mouth and make a batch at home! Word to the wise, it’s perfect spooned on top of Vanilla Bean Ice Cream. Quick question: either I’m completely incapable of reading or you’ve forgotten to indicate at which stage in the process the shortening gets added in. Thanks for any clarification! 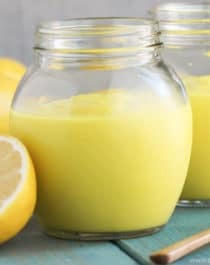 Rosalie- I’m glad this healthy lemon curd recipe can help you and your parents feel better about what they are eating! By saying shortening, are you referring to the fat which is is actually not fat but listed as butter flavor? I don’t see anything else in the process you mentioned that could qualify. I really wanted to make this right now but I’m clueless. I LOVE lemon curd! I am, however, allergic to almonds. What would be a reasonable substitute? I use coconut flour, but it has a much stronger flavor than the almond flour, and I know it’s not an equal swap. Any suggestions? Judy- You can use any “milk” you like… like coconut milk, soy milk, rice milk, oat milk, etc. Almond flour is not used in the recipe. I wouldn’t recommend adding coconut flour to the recipe because it will absorb too much liquid and might make the curd gritty. Can I still use butter for this? I trust a cow more than a chemist. Also, the non-hydrogenated shortening I linked to in the recipe is not a chemical or manmade ingredient. It is nothing like “I can’t believe it’s not butter” or margarine, it is organic and made from palm fruit oil, not the genetically modified canola or soybean oil. Anyways, I hope you like the recipe! Hold the phone! OMG. I made lemon curd about a month ago – with real eggs – and have to say I couldn’t eat it. I knew there was a tonne of eggs in there. And while I am not a strict vegan, I could not bring myself to eat that much butter, eggs and sugar. This is really awesome. I have to try this! What a wonderful recipe! I will have to try it with Lakanto, also a sugar free zero glycemic sweetener. I have been wanting to make a lemon curd and yours looks great! Have you used it for a filling between layers in a cake?? I am wondering how it would hold up. I haven’t tried this recipe without the shortening but I believe it makes it more creamy and holds it together better. You can probably reduce the amount a couple tablespoons no problem. If you omit it completely, just try to serve the curd as quickly as possible because it might separate in the fridge… if it does though you can probably just whisk it back together. I hope this recipe works out for you! Glad to see you making a vegan lemon curd. 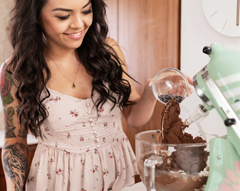 I’ve found other recipes – they keep in jars too for a while, not sure why yours doesn’t? But it does look like a great recipe! And all such recipes prove ther is no need to use eggs – they are so cruel. Billions of wee fluffy male chicks gassed or crushed every year around the world (30 million in the UK alone) -whether organic or not -because they can’t lay eggs and are too scrawny to breed for meat. I’ve seen the footage, it’s awful and most people haven’t a clue about the real cost of eggs. So I hope you will keep on devising lovely cruelty-free vegan recipes! Best wishes, Jane. 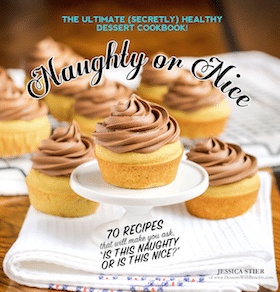 PS I think you would love Ms Cupcake’s all vegan baking book – awesome recipes! I make a vegan chocolate sauce sweetened only with stevia and it is terrific! I am on my way to the kitchen to make both the lemon curd and chocolate sauce. I think this post just made all my wildest dreams come true. You may have already answered this but what exactly is natural butter flavor? Is that a proper substitute for vegan dishes? Butter flavor provides a buttery flavor just like how vanilla extract provides a vanilla flavor. The butter flavor I linked to in the recipe is vegan (I contacted the company a few years ago and they said it was dairy free and vegan), but there are butter flavors out there that DO contain dairy, so always read the label! Don’t see the shortening everyone is talking about, only butter flavoring. Am I missing something? I made it with coconut sugar and the taste is amazing but the color is not very appetizing, poo brown. Mine didn’t thicken. It’s very liquidy still. Is there a way to fix this? Not sure what happened there… did you make any ingredient substitutions? The butter flavoring in this recipe contains Propylene Glycol as a main ingredient and this compound is suspect of causing MULTIPLE negative effects, one of which makes it not recommended for infants and pregnant women. This curd looks wonderful and thank you for the vegan option but maybe an alternative to the Propylene Glycol would also be helpful. This looks delicious! I can’t wait to try it! Do you think this could stand in the oven? I want to try a lemon meringue pie with it? Thank you! I’m going to try this today! How long does the lemon curd last in the refrigerator? I can’t find butter any butter flavour in my local shop, will any butter substitute do? I usually use one made from coconut or avocado. Someone asked you about the spoons….what about the jar you have this curd in? I love it! Any idea where to find some? P.S. Just found your website this morning (and already made the gummy bears)….love it. Thanks! Why is Turmeric used? Does it add the color or does it do something to enhance the flavor? Does this have any detectable coconut flavour? Looks UH-mazing!!! 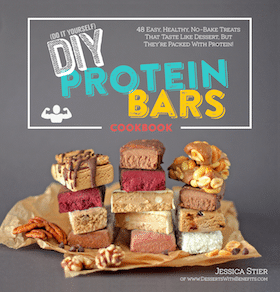 I need to try these ASAP… Pinned! How long does it last in the fridge and have you jarred it for longer storage? I think this post just made all my wildest dreams come true now.